Seafood on ice, it said on the menu. It doesn’t quite describe the delight of an appetizer that formally started our Moonlit Wine Dinner at the Blu Bar and Grill of Marco Polo Plaza Cebu. Smoke enveloped the dish as it was brought to the table over exclamations of amazement, a pair each of fresh shrimps, mussels, scallops served atop a block of ice shaped like a bowl. MAIN COURSE. Marco Polo chefs slice roast tenderloin for serving to those who joined the Moonlit Wine Dinner at the Blu Bar and Grill. It came with the perfect complements: half a slice of lemon wrapped in a dainty net to trap the seeds when squeezed, spicy tomato-based dip, and a glass of Baron de Philippe de Rothschild Reserva Especial Chardonnay from Chile. Our wine-pairing dinner just started, but it was easy to see we were in for a treat. SEAFOOD ON ICE. 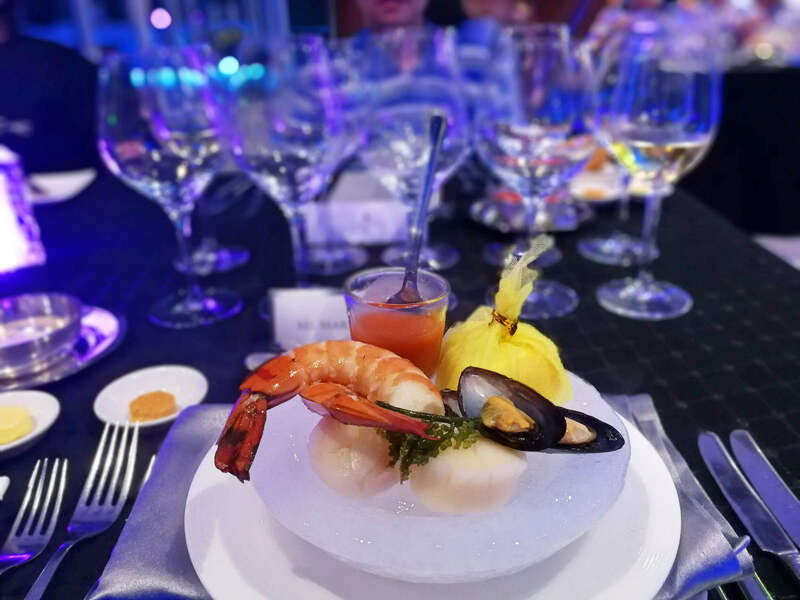 Smoke enveloped the dish as it was brought to the table over exclamations of amazement, a pair each of fresh shrimps, mussels, scallops served atop a block of ice shaped like a bowl. We savored the foie gras paté with a glass of carmenere in between conversations that hopped from good food to family and reminisces of travel, in particular Taiwan, because we happened to be seated near a Taiwanese working for a Japanese IT company in Cebu. The main course was Churrasco, and it included freshly roasted tenderloin slices and lamb cubes, sausages, pork belly, and fish fillets. We enjoyed the meat selections from both land and sea with another glass of red wine, this time poured from a bottle of Baron de Philippe de Rothschild Escudo Rojo. MAIN COURSE. The main course was Churrasco, and it included freshly roasted tenderloin slices and lamb cubes, sausages, pork belly, and fish fillets. This was paired with a bottle of Baron de Philippe de Rothschild Escudo Rojo. Marco Polo Plaza Cebu’s Moonlit Wine Dinner combined creations by the culinary geniuses of the Blu Bar and Grill and wines from Chile distributed by Titania Wine Cellar, Inc., said General Manager Mr. Brian Connelly. “It’s not just the fact that the food and wine are both great, but the way we put them together to complement each other,” Mr. Connelly told dinner guests shortly before the start of the dinner. PISTACHIO ice cream on warm choco lava topped with vanilla sauce, paired with a glass of merlot. Manna Alcaraz, Marco Polo Plaza Cebu Communications Manager, said the wine-pairing dinner was intentionally scheduled last October 27, 2017 when it was waxing towards a full moon. She added that the initial plan is to hold it one night every month when there is a lot of moonshine but they would probably start with quarterly Moonlit Wine Dinner events for now. The first Moonlit dinner introduced wines manufactured under the Baron de Philippe de Rothschild brand and distributed in the Philippines by Titania Wines. ROAST PORK. One of the many highlights of a great evening: delicious food, good wines, and great company. Mr. Connelly said the wines that accompanied the food, from the chardonnay and escudo rojo to cabernet sauvignon, include some very fine selections from Chile. From a full main course, we feasted on a selection of cheeses washed down with the Baron de Philippe de Rothschild Reserva Especial Cabernet Sauvignon. Dinner ended on a sweet note with pistachio ice cream on warm choco lava topped with vanilla sauce, made all the sweeter by a glass of merlot. Interested in this incredible extravaganza of food and wine? Call Marco Polo Plaza Cebu at +6332 253 1111 for the next wine pairing dinner schedule. GOOD FOOD, GREAT COMPANY. Our table with Manna Alcaraz (raising wine glass), Marco Polo Plaza Cebu Communications Manager, writer Dr. Nestor Alonso (standing) and staff of Titania Wines. CHEESES. This plate was paired with Baron de Philippe de Rothschild Reserva Especial Cabernet Sauvignon. FOIE GRAS PATE paired with a glass of carmenere. FOOD, WINE PAIRING. Marco Polo Plaza Cebu General Manager Mr. Brian Connelly watches fireworks after opening Moonlit Wine Dinner. “It’s not just the fact that the food and wine are both great, but the way we put them together to complement each other,” he says. MARCO POLO CHEFS get a much-deserved applause from the dinner guests. MOONLIT WINE DINNER combined creations by the culinary geniuses of the Blu Bar and Grill and wines from Chile distributed by Titania Wine Cellar, Inc.